Attorneys are keeping an open mind about the potential impact on their livelihoods of a software-based product that aims to make it easier for consumers to file bankruptcy without their help. Upsolve was launched two years ago to assist people who can’t afford to file Chapter 7 get a fresh start. The non-profit is designed as a legal disrupter and is often compared with TurboTax, the software tool that revolutionized tax filing and pressured accountants when it was developed in the mid-1980s. But Upsolve’s purpose of giving financially distressed low-income consumers a legal lifeline has its limits even though its expanded to 14 states with plans to target New York, Chicago and Los Angeles. “It’s one piece of the puzzle,” Henry Callaway, chief judge of the U.S. Bankruptcy Court for the Southern District of Alabama and an Upsolve advisory board member, told Bloomberg Law. John D. McMickle, a bankruptcy policy advocate and co-founder of the consulting firm North South Government Strategies, told Bloomberg Law there “will always be a role” for lawyers in complex bankruptcy cases. “Why not give people who can’t afford it a low cost way to get an on ramp to the bankruptcy system?” he asked. The focus is on simple cases with below median income debtors who don’t have assets like a house or a car, Warren Agin, a principal at Boston’s Analytic Law LLC, told Bloomberg Law. These debtors mostly have credit card and medical debt. Agin, a former Chapter 7 trustee, teaches legal analytics at Boston College Law School and is an Upsolve advisory board member. Upsolve’s web portal walks them through questionnaires using plain language to create forms that are filed with the bankruptcy court. The cases are filed pro se, or without an attorney, but a pro bono lawyer from a legal aid clinic reviews them and identifies any potential problems. The program screens people out, and “if you have a house or personal injury claim, for example, Upsolve isn’t the right platform to use,” Jonathan Petts, Upsolve co-founder and executive director, told Bloomberg Law. Upsolve estimates about 20 million consumers could benefit from its assistance based on 126.2 million U.S. households in 2017, Petts said. Individual Chapter 7 filings fell from 1.23 million in calendar year 2012 to just over 662,768 in 2016. 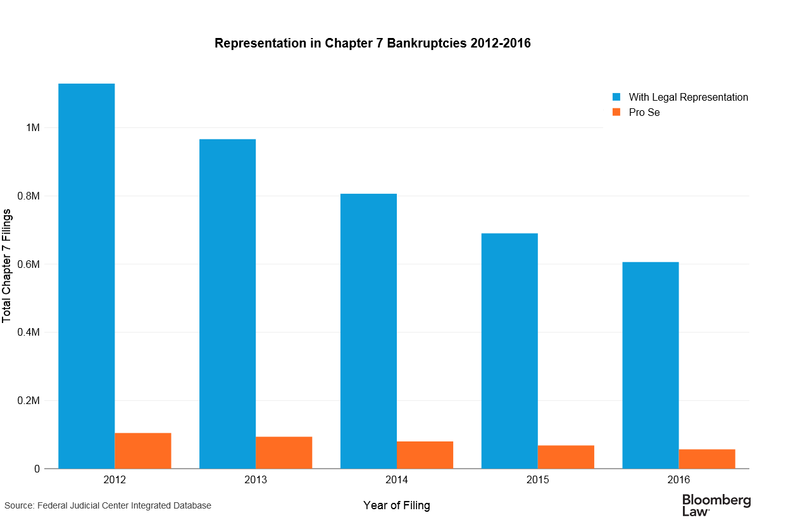 Roughly 9 percent of Chapter 7 filings for the 2012-16 period were pro se, according to data from the Federal Judicial Center analyzed by Bloomberg Law. Henry J. Sommer, an Upsolve advisory board member who’s president of the National Consumer Bankruptcy Rights Center and editor for Collier on Bankruptcy, isn’t a fan of pro se debtors because they have to rely too much on trustees, who administer the case. Chapter 7 also is hard to file unassisted and a lawyer costs about $1,500, Petts said. And the average attorney charges $250 per hour and may take between seven to 10 hours to prepare an average debtor’s paperwork, he added. Most industry professionals interviewed by Bloomberg Law acknowledged benefits for low-income consumers are overdue. But they agree that software-based solutions are not a universal application, and don’t believe the technology would revolutionize bankruptcy, or threaten the livelihoods of professionals. Even with a simpler filing system, there are a number of potential stumbling blocks for debtors that an attorney can help avoid. For instance, there will be situations where the debtor doesn’t understand all of the questions on the program, but they won’t know there is a problem until they get to the Bankruptcy Code Section 341 “meeting of creditors” where the Chapter 7 trustee presides, Alane Becket, a partner with Becket & Lee LLP, Malvern, Pa., said. At that point, debtors may tell the trustee the pro bono attorney helped them file the paperwork, but they may not fully understand the pro bono attorney isn’t their counsel of record on the case. That attorney isn’t with them at the Section 341 meeting either, said Becket, also president-elect of the American Bankruptcy Institute. That’s where debtors can get into trouble. They may need to refile after the case is dismissed, but there can be issues with a limited automatic stay and a bar to refiling, she said. Retired bankruptcy Judge Eugene R. Wedoff said debtors still will need an attorney to decide if they should file Chapter 7 or Chapter 13, where a debtor with income makes payments over a three-to-five-year plan. There also are considerations requiring lawyer assistance, such as whether a debtor should agree to reaffirm or keep certain debts or what exemptions to claim, he said. Upsolve has continued to tweak its technology so it can now handle cases with car loans, Petts said. “We’re learning as we go,” Petts said, noting that this addition to the program is so new that he didn’t have any data on it yet. But that area “can present all sorts of potential dangers, especially when a car lien hasn’t been perfected or recorded correctly,” Ed Boltz, a consumer advocate and partner at the Law Offices of John T. Orcutt, P.C. in Durham, N.C., told Bloomberg Law. Reaffirmation agreements can also be hazardous, said Boltz, who’s also the former president of the National Association of Consumer Bankruptcy Attorneys and an Upsolve advisory board member. John Rao, an attorney with the National Consumer Law Center in Boston who specializes in bankruptcy and mortgage servicing, said testing and evaluation is still needed. He’s skeptical, but still “open-minded” that software solutions can work for simple bankruptcy filings. William Kransdorf, project director of New York City’s Bankruptcy Assistance Project, Legal Services, which files free, simple bankruptcies for low-income applicants, favors the Upsolve model so long as it has an adequate pro bono component. Rao noted that bankruptcy judges are more accepting of pro bono attorneys reviewing cases without making an appearance, and added that fewer cases will get dismissed and forms will be more complete than if a debtor files completely pro se. Wedoff, the immediate past president of ABI, said the ABI’s Commission on Consumer Bankruptcy might endorse the idea of making consumer bankruptcies more readily available at a lower cost when it releases its recommendations in December. He also suggests Upsolve successfully could be used commercially by legal offices so they could charge less and spend less staff time producing the required forms. And Upsolve’s not alone in the space either. Software solutions won’t “displace the debtor’s bar, but it could disrupt it by capturing a larger percentage of debtors,” Lawrence A. Friedman, immediate-past president of the Executive Office of the U.S. Trustees, told Bloomberg Law. “It’s an exciting time,” but it’s “just the beginning,” said Friedman, who’s engaged with a group that intends to have a commercial software solution in place sometime this summer. — With assistance from Bloomberg Law Data Editor Christina Brady.